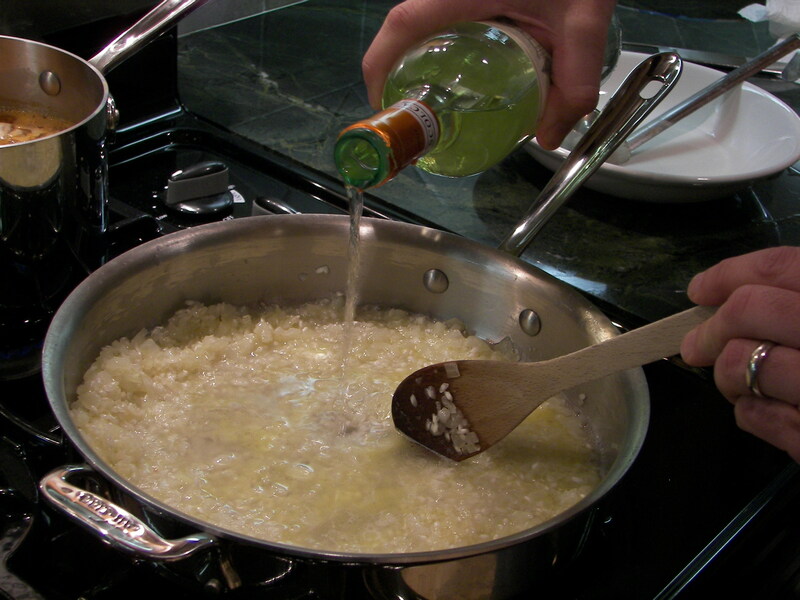 Risotto is a staple in our kitchen repertoire. It is a hearty dish that is quick and easy to prepare with minimal mess. 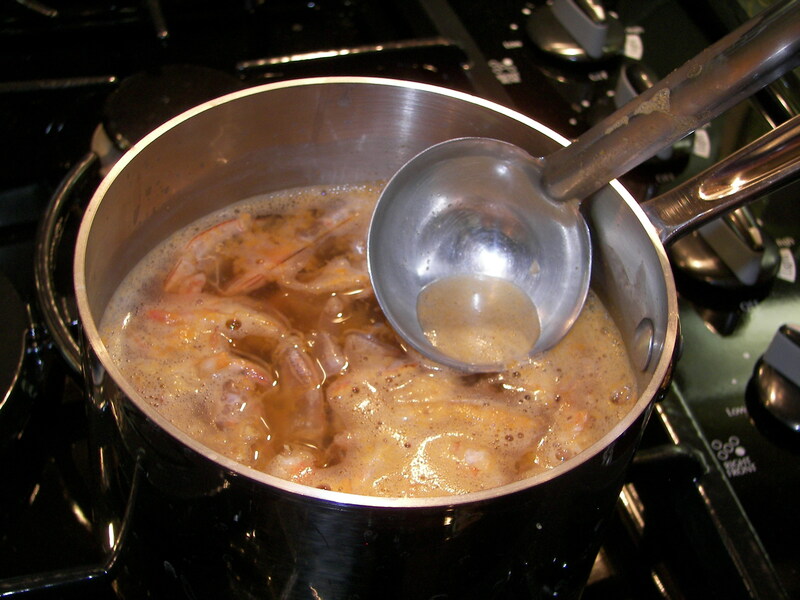 Once the basic technique is mastered, any number of different variations can be created by simply changing the main ingredient (in this case Shrimp) and the type of stock used. The Shrimp version seems to be a favorite among our dinner guests. The dish usually earns accolades far greater than the amount of effort exerted in preparation. We typically serve it as a starch course to accompany white-fleshed fish such as Swordfish or Halibut. Other times, Janine and I prepare it as a main course when we are dining alone and desire something from the sea. 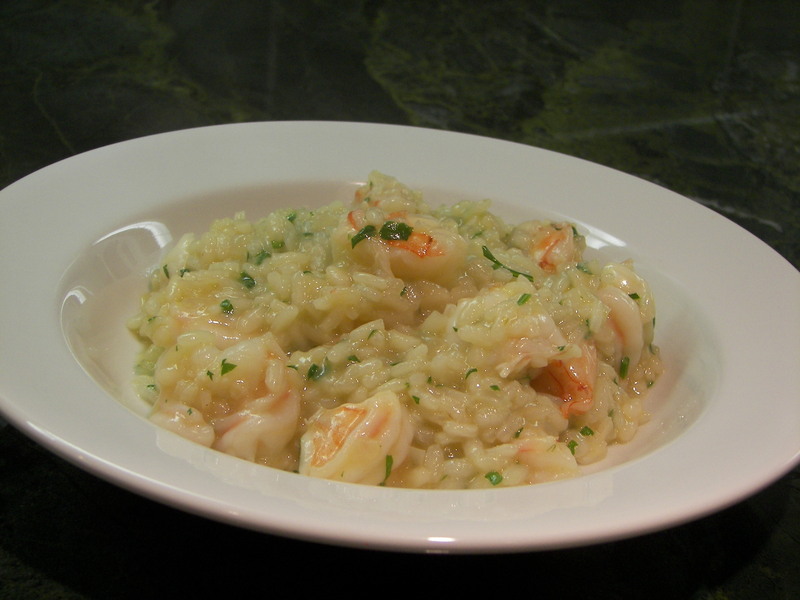 A bowl of Shrimp Risotto, a crisp green salad, and a glass of dry white wine makes for a quick meal without much fuss. The following recipe will yield two generous portions. Homemade Shrimp stock would be best for this dish. If none is available, store-bought seafood stock is an acceptable alternative. I prefer the “Better Than Bouillon” brand. Both Lobster and Clam base work well. Kitchen Basics Seafood broth or Knorr Fish Bouillon will also suffice. The salt content varies in each brand. 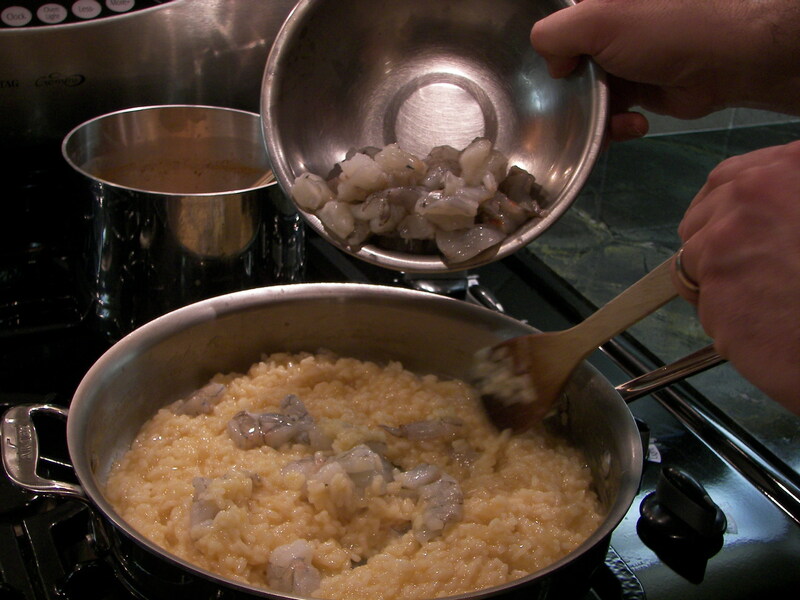 Make sure to taste the risotto and adjust the seasonings before serving. The recipe calls for 6 cups of stock. You may not use all of it but better to have excess at the end than run out before the recipe is complete. The Shrimp shells play an integral part in flavoring the stock. Do not discard them. Pour the stock into a medium sauce pan. Keep the pan in close proximity to where you will be cleaning the Shrimp. Peel the Shrimp. Place the legs, shells, and tails into the sauce pan as you go. 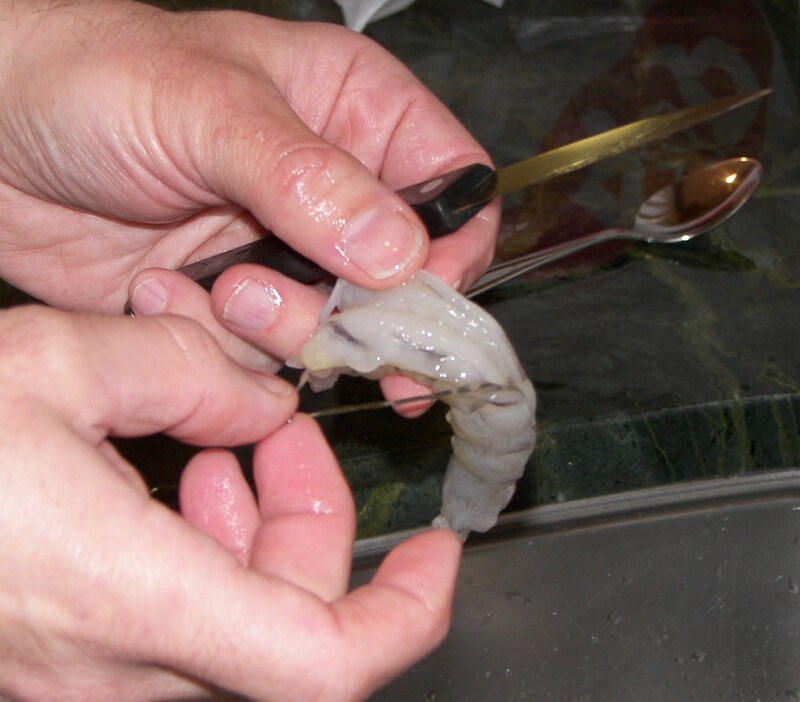 With a small paring knife, cut a shallow slit along the back of the shrimp, running from head end to tail. Open the slit, remove the vein (intestinal tract) and discard. Do not put vein in sauce pan. Note: Holding the Shrimp under a light stream of water from the kitchen faucet makes this task easier. Cut shrimp into bite-size pieces. I like to cut Shrimp into various shapes. This provides interesting texture to the dish. Small ones are left whole. 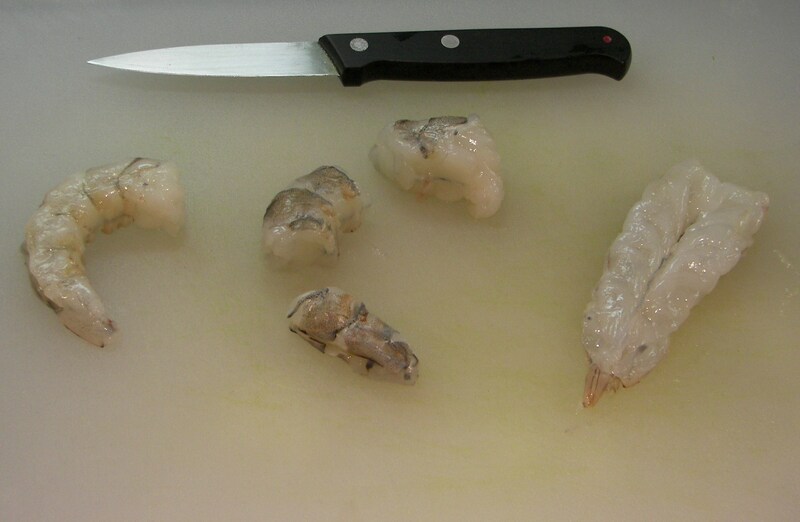 The mediums-size Shrimp are butterflied and the large ones are cut into thirds. The Shrimp will be incorporated into the rice mixture at the last moment. Store them in a bowl and refrigerate until then. Place the saucepan containing stock and Shrimp Shells over a low flame on the stove. Bring to a slow simmer. Use a small ladle to skim off any impurities (foam) that floats to the surface. Discard. Maintain a low simmer throughout the entire cooking process. Note: This recipe requires small amounts of stock to be added to the rice periodically throughout the cooking process. Use a stove burner for the stock that is close to the burner used for the rice. When ladling stock into the rice, slide the saucepan over to abut the rice pan. This will help prevent stock dripping on the stove. Heat butter and oil in a sauté pan over medium low heat. 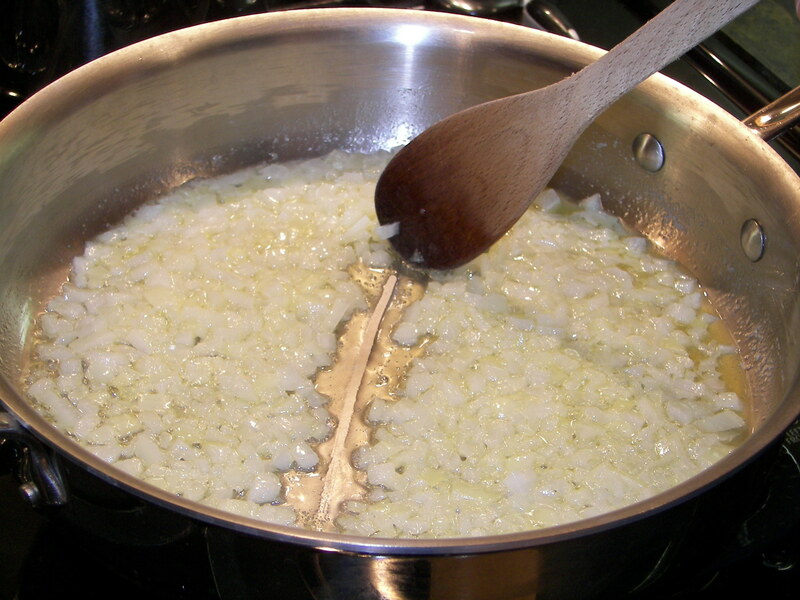 When the butter has melted and stopped sizzling (This means the water content in the butter has evaporated), add the diced onions. Sauté the onions until they become translucent. Add rice to pan. 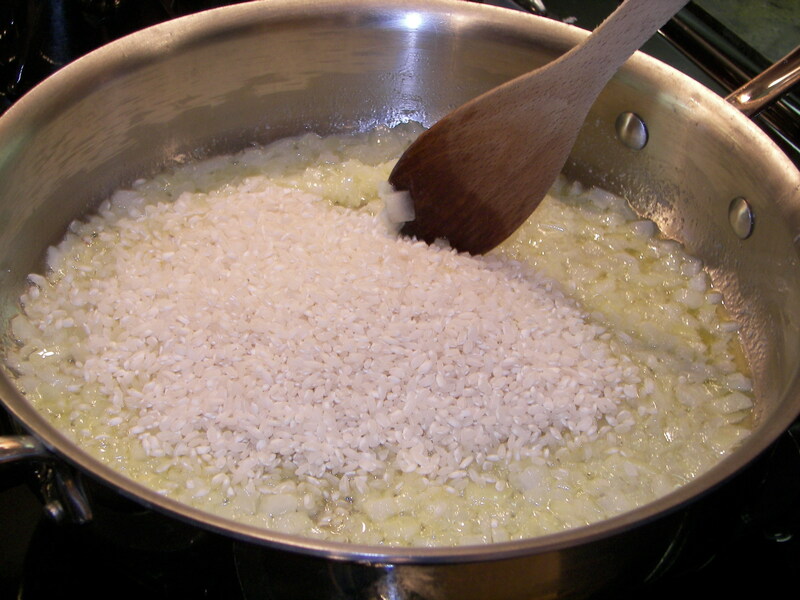 Stir until evenly coated with oil. Add wine to pan. Adjust heat to maintain a moderate simmer. Stir constantly. Continue stirring until wine evaporates and rice/onion mixture becomes thick. Add about 1 cup of stock. Note: Ladle stock from saucepan and pour through strainer into rice mixture. The strainer will prevent any shell fragments or impurities from being added to the rice. Continue to stir until stock has evaporated. When mixture becomes thick, add another ½ cup of stock. Continue stirring until evaporated. 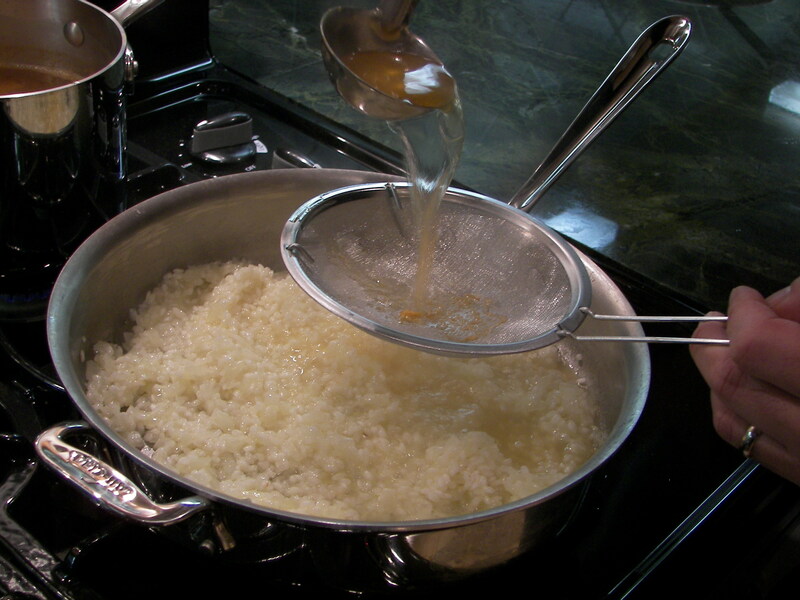 Repeat process, adding ½ cup of stock at a time and stirring until the rice becomes creamy. Note: Tasting is the best way to determine if the rice is done. It should be creamy to the palate and al dente to the chew. Any hint of grittiness or uncooked starch is an indication that more stock and stirring is needed. 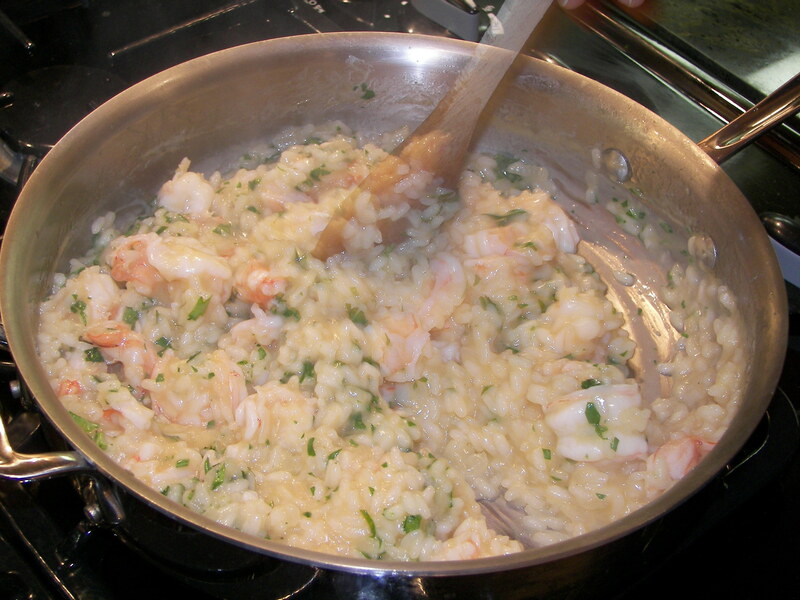 Add the shrimp and an additional ½ cup of stock at the first indication that the rice is cooked. Stir until the shrimp is just cooked through. Note: I tend to like the consistency of risotto a little on the thick side. True Risotto connoisseurs insist it should have a looser consistency (sort of like porridge compared to oatmeal). You can accomplish this be adding more stock and stirring until the desired consistency is achieved. Taste risotto. Add salt if necessary. Mix in chopped Parsley and serve. I’ll be trying the shrimp risotto! Gracie, P.
Thanks Paolo! Let us know how it comes out. Insanely delicious. 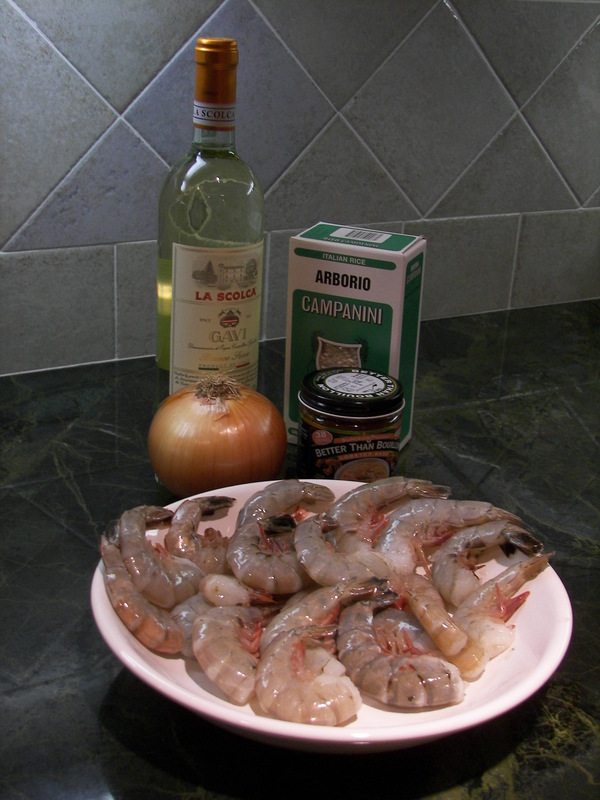 I just used Kitchen Basics seafood stock, bought peeked deveined shrimp to keep it simple. Added a bit of lemon zest with the parsley. Fantastic! We are glad you enjoyed the recipe and thank you for visiting our blog.